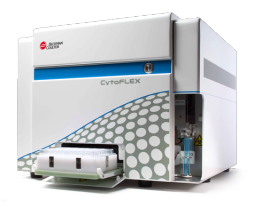 Ultra-flexible, high performance CytoFLEX system brings you easily upgradeable detection capabilities for up to 3 lasers and 13 color research flow cytometry right on your bench top. The high-performance CytoFLEX system offers scalable detection capabilities for up-to three lasers and 13-color research flow cytometry right on your benchtop. The CytoFLEX system is easy to learn, easy to operate and easy to maintain. An intelligent patent-pending optical design optimizes excitation from up-to three lasers (488nm; 638nm; 405nm) and light collection efficiency. With unique flow cell design and integrated optics, the innovative Wavelength Division Multiplexing (WDM) detection module includes solid-state, high efficiency, low-noise detectors for excellent performance. The WDM’s bandpass-only design guarantees flexibility with easily changeable filters and 4-13 configurations. When equipped with a violet laser, the CytoFLEX can be set up to measure Side Scatter from 405nm for enhanced nanoparticle detection. Mie theory predicts that the scattering cross section of a particle, and thus its scattering intensity, depends on the wavelength of light, the angle of collection, and the size, shape, and refractive index of the particle. All other factors being equal, using a shorter illumination wavelength will result in an increase in scattering cross section, and thus more scattered light. The CytoFLEX offers light scattering parameter measurements from the 488nm laser light, and optionally from the 405nm laser to enhance small particle detection. With future-proof upgrade options for up-to 13 colors, the CytoFLEX system evolves as your application needs change. Upgrade your configuration in less than one day knowing that all CytoFLEX instruments have been fully tested across all configuration types. The instrument has the capacity for 15 parameters, including 13 for fluorescence detection. The fully activated instrument includes five channels from the 488 nm (Blue) laser, three from the 638 nm (Red) laser, and five from the 405 nm (Violet) laser. Instruments with as few as four fluorescent channels activated are available with the ability to activate additional parameters as needed by purchasing an activation key. Fixed integrated optics and quartz flow cell design with >1.3 numerical aperture. Proprietary Axial Light Loss (ALL) sensor system using silicon photodiodes with built in 488/8 μm band pass filter. Fluorescence and side scatter light delivered by fiber optics to Avalanche Photo Diode detector arrays. Proprietary design ensures high performance, high efficiency, low-noise signal detection. Emission profiles are collected using reflective optics and single transmission band pass filters. Option to configure Avalanche Photo Diode detector array to collect side scatter signal from Violet (405 nm) laser. The configured channel (VSSC) can be utilized to better resolve nanoparticles below 200 nm size threshold. Fixed Flow Rates: 10, 30 and 60 μL/min. Custom Flow Rate Control mode from 10 to 240 μL/min in 1 μL increments. Gravimetric calibration for absolute counts within CytExpert Software. Az elmúlt évtizedben megélénkült az érdeklődés a szekretált membrán vezikulák, összefoglaló néven extracelluláris vezikulák (EV) iránt, hiszen EV szekréciót írtak le többek között hematológiai, kardiovaszkuláris, neurológiai és autoimmun kórképekben, valamint daganatos megbetegedésekben is. Az extracelluláris vezikulák tanulmányozásának egyik legfontosabb eszköze - a mikroszkópia mellett - a flow citometria, mindazok ellenére, hogy a hagyományos műszerekkel az EV populációnak csak kis része volt detektálható mérettartományú. A Beckman Coulter készülékekben alkalmazott új technológiai megoldásoknak köszönhetően - mint például az AstrioEQ sejtszorterben a speciális FSC detektálás, vagy az új CytoFLEX készülékben a Violet SSC - a citométerek és szorterek egyre inkább alkalmasak a szubcelluláris mérettartományú részecskék vizsgálatára. Az új eszközökkel elérhető ismeretek előrelépést hozhatnak a fent említett betegségek patogenezisének megértésében, emellett új diagnosztikai és terápiás lehetőségeket is teremthetnek, ezért a webinar témája nagy érdeklődésre tarthat számot. A Beckman Coulter szakértői csapatának tagja előadásában az immunológia egyik izgalmas területét, a veleszületett limfoid sejtek (ILC) témakörét járja körül: ismerteti a legfrissebb irodalmi adatokat, kitérve a kapuzási stratégiára és a megfelelő kompenzáció gyakorlati szempontjaira is. 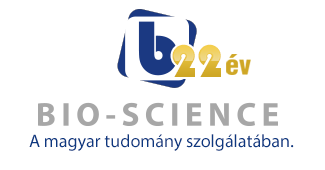 A flow citometria világszerte ismert szaktekintélye, J. Paul Robinson a BC új flow citométerében, a CytoFLEX készülékben alkalmazott innovatív technikai megoldásokról tart előadást. Győződjön meg ön is a CytoFLEX kimagasló érzékenységéről és detektáló képességéről! Az érdeklődőknek cégünk DEMO lehetőséget biztosít! Generation of fluorescent antibody or genetic labels to identify hormone and neurotransmitter receptoractivity can be difficult and time consuming. A useful alternative is recording physiological changes inresponse to agonist binding its cognate receptor, many of which are G-protein coupled. When an agonist binds a G-protein coupled receptor, it triggers a quick cascade of events that often results in a transient release of calcium from intracellular stores. Alterations in transient intracellular calcium ([Ca2+]i) levels have been used previously in flow cytometry to identify functional receptor expression in cellular subpopulations , here we show that peristaltic sample delivery of the new CytoFLEX analyzer is particularly well suited to agonist-based calcium studies. Using the ester based, green fluorescent calcium indicator, Fluo-4 AM (Life Technologies), [Ca2+]i changes were measured in HEK-293 cells in response to ATP stimulation. Simple plumbing modifications to the CytoFLEX allowed easier access to the sample tube for agonist application; further modifications were made to implement a “stop time” technique. By using response to agonist as our physiological criteria, we have fundamentally enabled receptor identification and conclusively demonstrated its functionality. Evaluation of the Xitogen flow cytometer, by independent research flow cytometry laboratories and Beckman Coulter senior research and development scientists, was performed using flow cytometers equipped with 12 parameters and 9 fluorescent detectors. Instruments were equipped with the enhanced Side Scatter channel (VSSC) option. Evaluation of biological specimens included fresh human whole blood, human leukocyte control cells, and smaller cells and particles, such as RBCs, platelets, microbes, liposomes, and vesicles. The measurement and the characterization of Extracellular Vesicles (EV) have been of growing interest over the last 20 years. Flow cytometry instruments were not the most appropriate way to analyse these particles as the optical resolution of instruments was insufficient to detect particles below 250nm. However, the Beckman Coulter CytoFLEX* now offers the ability to measure EV down to at least 150nm and allows the detection of their cellular origin using up to 13 fluorescence parameters. Regardless of the technical improvements the set-up of the instrument is still a critical point and several requirements need to be met which are illustrated here. with other methods, flow cytometry has the big advantage that EV can be detected as rare events, in high numbers and by antigens on the surface, which characterize their cellular origin.